When I set up this blog, I was drawn to the MistyLook template by Sadish [NOTE: I have since changed to Tarski 1.1.3 by Benedict Eastaugh and Chris Sternal-Johnson]. One of the things I liked was how easy it is to change the graphic at the top. I’ll likely change it from time to time. The photo that is currently at the top is Camp Chase Cemetery on Sullivant Avenue in Columbus. This particular photo is a crop of a photo I took there in October 2004. Camp Chase was a Civil War recruitment and training camp and a prison for Confederates. According to OhioHistoryCentral, in 1863 more than 8,000 men were imprisoned there. Records for Camp Chase can be found at the Ohio Historical Society in Columbus. 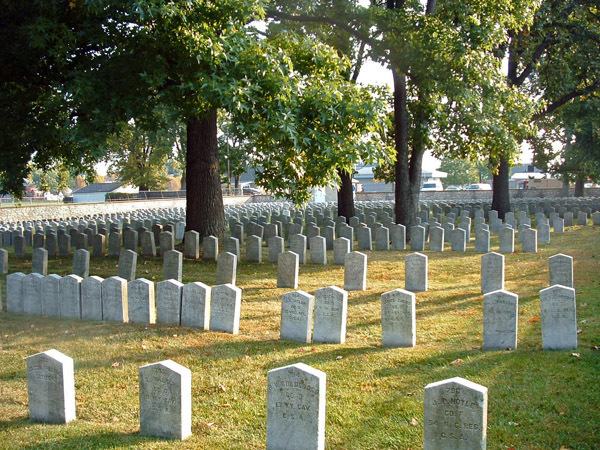 The cemetery has approximately 2,260 burials. You can find pictures of individual tombstones at Leona Gustafson’s site. It is hard to get the scale of the cemetery without going there in person. Parking can be found on side streets off of Sullivant Avenue.